A temporary export bar has been placed on a rare Meissen Böttger stoneware figure. The Commedia dell’arte figure is at risk of being exported from the UK unless a buyer can be found to match the asking price of £270,000. Meissen is renowned across Europe as being the first true hard-paste porcelain factory in 18th century Europe. The rare, fragile and translucent porcelain imported from China and Japan was a source of wonder to kings, princes and aristocrats across Europe at the time, with many attempting to replicate these efforts. The production of hard-paste porcelain was preceded by the creation of a very fine high-fired earthenware. This stoneware figure is an outstanding example, which demonstrates the cutting-edge technology of the time. It is one of an extremely rare group of models after the Italian Commedia dell’arte theatre, for which the factory at Meissen subsequently became famous. The decision to defer the export licence follows a recommendation by the Reviewing Committee on the Export of Works of Art and Objects of Cultural Interest (RCEWA), administered by The Arts Council England. The RCEWA made its recommendation on the grounds of the figure’s aesthetic importance and for its outstanding significance to the study of Meissen porcelain and 18th century sculpture. The decision on the export licence application for the figure will be deferred until 1 October. This may be extended until 1 January 2018 if a serious intention to raise funds to purchase it is made at the recommended price of £270,000 (plus VAT of £4,500). Organisations or individuals interested in purchasing the figure should contact the RCEWA on 0845 300 6200. An image of the figure can be downloaded from our flickr site. 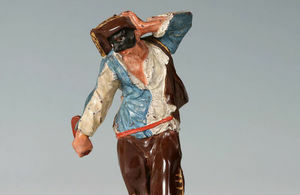 Details of the figure are as follows: A Meissen Böttger stoneware figure from the Commedia dell’arte, partly polished and with original colouring. 16.4cm high, 85.cm wide, 8.2cm deep. Circa 1710-13. Some surface wear to the colours, slight crack in upper right arm. Details of provenance: Emma Budge Collection. Sold in the Emma Budge Sale, Paul Graupe, Berlin, 27 to 29 September 1937, Lot 779. The Reviewing Committee on the Export of Works of Art and Objects of Cultural Interest is an independent body, serviced by The Arts Council England, which advises the Secretary of State for Culture, Media and Sport on whether a cultural object, intended for export, is of national importance under specified criteria.